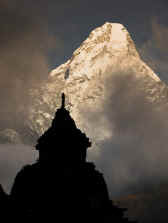 Trek high into the Everest region of Nepal along the original Everest climbing expedition route. Our journey is a leisurely walking holiday allowing plenty of time to get acquainted with the traditional Sherpa villages, Sherpa people and their customs. Absorb the beauty of the surrounding countryside and the magnificent mountain backdrop. When we have an expedition in progress on Everest, we invite you to join the climbing expedition at base camp for a rare opportunity to be be part of life on a major expedition. Meet international climbers from around the world and help cheer on our summit team. If we don't have an expedition in operation then we retreat to the cozy comforts of the lodge at Gorak Shep to sleep. 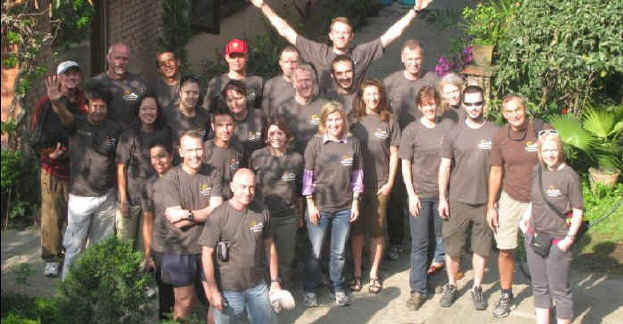 TREKKING BEST TIME OF YEAR LAND COST MORE..
WHY PRIVATE TREKS ARE BETTER? 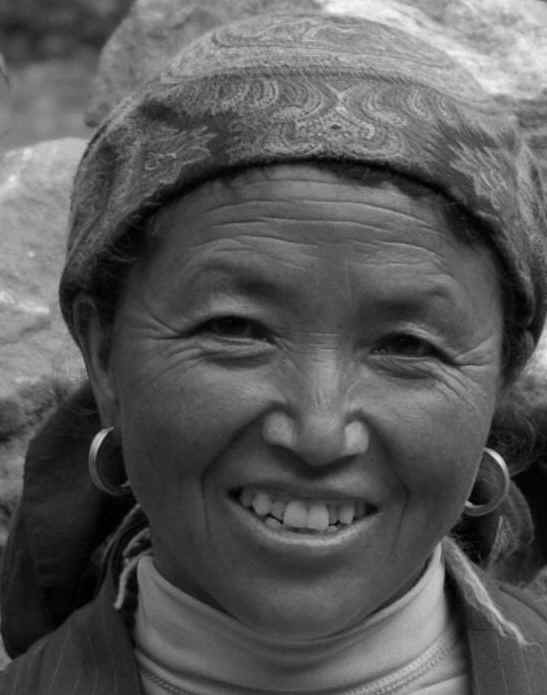 Offering more employment to our Sherpa guides than on big groups, low impact on the environment and villages, go your own pace, meet the families of your guides, get a one-on-one insight and knowledge of Sherpa culture. Gain new lifetime friends. April 2: Guided sightseeing tour of Kathmandu, afternoon on your own to explore/rest. 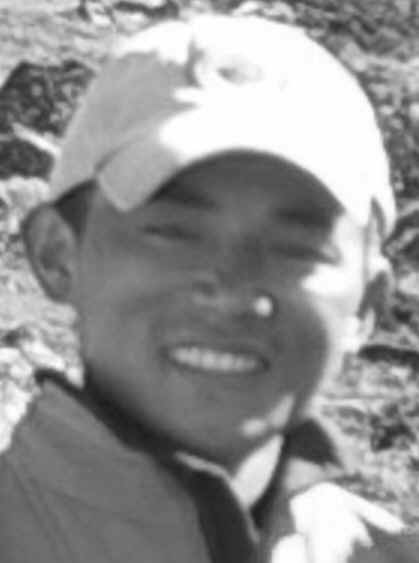 April 3: Departure to Lukla with climbing team on March 30's trek. Commence trek to Monjo. 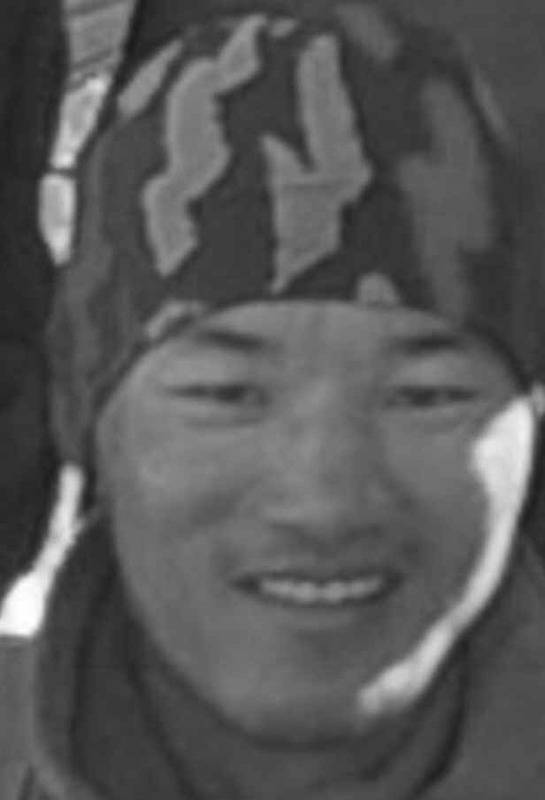 April 5: Acclimatization hike to Junde and Khumjung, return to Namche to sleep. 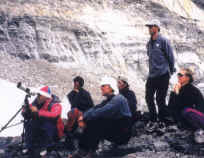 April 6: Trek to Tengboche, visit the monaster and chant with the monks. 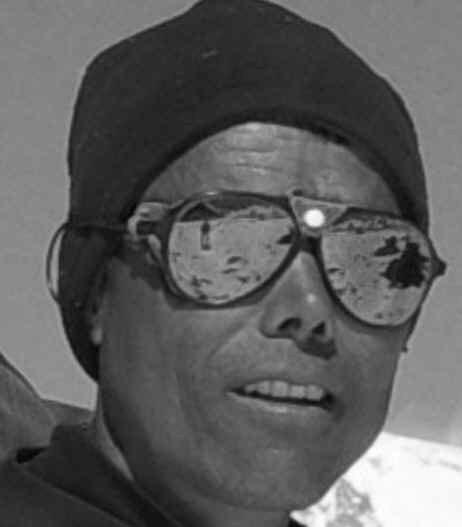 April 7: Trek to Dingboche, 14, 800 ft. return to Dingboche to sleep. 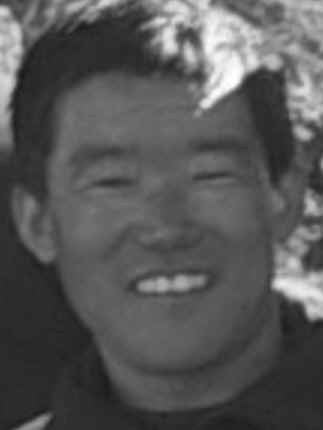 April 8: Trek to Chukung, 15,600 ft. or other high ascent for acclimatization purposes, return to Dingboche to sleep. April 9: Trek to Lobuche, overnight in a lodge. 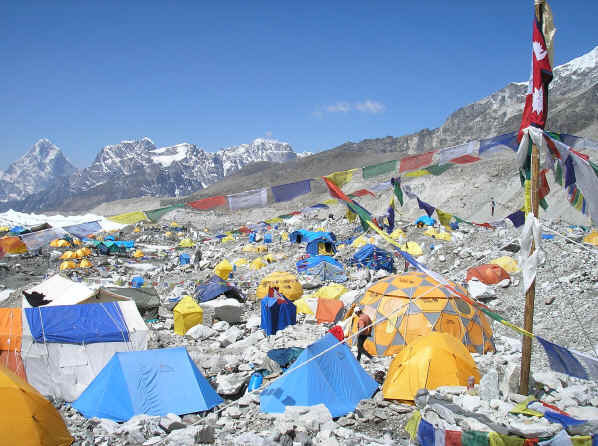 April 10: Trek to Everest Base Camp - overnight and celebrate with the Everest climbing team, expedition style in tents. Unique to Peak Freak participants. April 11: Flexible day for weather and health. April 12: Trek to Pheriche, overnight in a lodge. April 13: Trek to Namche Bazaar, overnight in a lodge. April 14: Trek to Lukla, overnight in a lodge. April 15: Prepare for trip home, Bon Voyage dinner party. April 16: Transfer to the airport for your international flight home or stay on to enjoy option tours. PEAK FREAK EXPEDITIONS INC. is owner operated by High Altitude Everest Guide Tim Rippel and his wife Becky Rippel from Nelson, B.C. Canada. 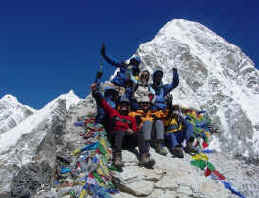 Peak Freaks is a distinctive addition to the Nepalese world of treks and climbing expeditions. 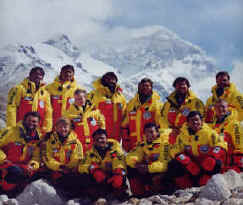 With 25 years experience and 62 Himalayan mountaineering expeditions to their credit they hold a flawless client safety record. Exploring old time-tested trails in more ways than one and developing lasting relationships between their guests and Sherpa families of friends is what we do best. We organize individual private standard and luxury treks that work well for the savvy traveler and also customize treks for , associations, researchers and educational trips. We've managed to generate a steadily increasing flow of clientele from all over the world. Our ability to offer affordable expeditions with first class infrastructure. Our relationship with the people of the country: Our family of friends become your family of friends. 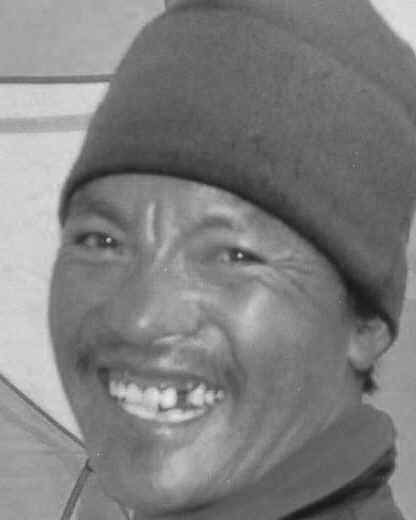 During our 25 years in the Himalayas we have become very close with our climbing Sherpa families. Today many of their children are now training to become our climbing Sherpas. We are family, grown and have learned so many life values together that we share with you. Our safety record: Climbing and trekking worldwide and other extreme sports while maintaining a 25 year flawless safety record. Custom Treks: Your dates, your style--- customized using standard and luxury lodges and only the best Sherpa staff who will often be a lifetime friend at trip end. Tim and Kim McCloy- Canada - Everest Base Camp support trekkers 2008.
every time my screensaver is activated. partway up the ice-fall, but that's for another trip someday. Thanks again for everything, Peak Freaks has blown our minds! The development of locally managed lodges along the popular trekking trails in the Annapurna, Everest and Langtang/Helambu areas have resulted in an increasing number of trekkers making use of these facilities. In recent years with the help of Government as well non-Government agencies many of these lodge owners have gone through training programs aimed at raising the quality of services as well as instilling environmental awareness. For example in the Annapurna Sanctuary and adjacent areas it is now regulation for all lodge owners to use alternative fuel (fuel other than fire wood - kerosene, gas, electric or even solar) for cooking and heating, dispose of garbage properly and adopt other eco-friendly measures. Most lodges have all the basic requirements for trekkers to stay overnight - a dormitory, several private rooms, an attached restaurant, toilet and a shower room. The quality of food offered might vary from lodge to lodge but most serve simple and hygienic meals. Peak Freak Expeditions Inc. has found it very attractive for trekkers to use these lodges on the routes instead of operating camping style treks. 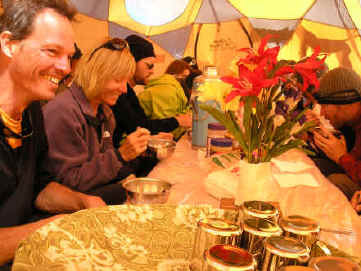 One of the main reason being that along these popular routes almost every house offers bed and meals and many camping trekkers find it incongruous to camp near a lodge and not be able to experience the warmth and hospitality of the friendly Nepali hosts. The other important reason being that this helps the local economies directly by using the facilities along the trail. To make sure that our guests do not get disappointed we stay in a comfortable and interesting lodge in each place. With larger groups we reserve all the beds in a lodge thus making sure that we have the place to ourselves. Quite often our lodge trekkers are overwhelmed- by the homey atmosphere and the grace of our hosts and many have made great friends with our friends for many years. If you have an urge to trek in some of the most beautiful places in Nepal, interact and make friends with the local people without having to sleep in a cold and lonely tent, Lodge Trekking is just the thing for you. Nepalese Food-Sherpa Food a Food Fiesta Nepal serves cuisine from around the world! 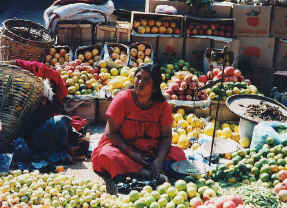 As facilities for travelers in Nepal are ever improving so too is the variety and quality of food being offered. Fifteen years ago, visitors to Nepal had a choice of rice and lentils (dal bhat) or lentils and rice. Today, it is not uncommon to find items as diverse as Norwegian Salmon, Cajun chicken and imported sashimi on the menus of Kathmandu’s finer hotels and restaurants. Authentic Italian pizza is available, cooked in a wood pizza oven by a genuine Neapolitan. Ice creams, Austrian sausages, French baguettes, and Spatzle are all part of the ever expanding Kathmandu kitchen. Even outside of the capital one can find good food. The lakeside resort town of Pokhara is filled with restaurants serving Continental and Asian food Even Mexican dishes are known to make it onto the menus. 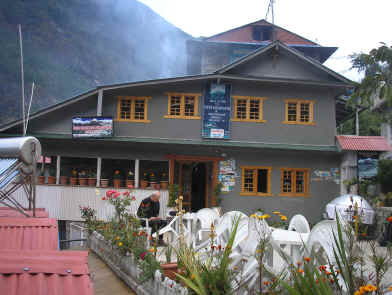 Along the popular trekking trails as well are plenty of teashops and lodges with surprisingly diverse menus. 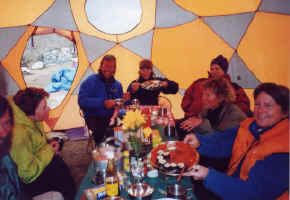 In the mountains, it is generally better to stick to dishes prepared with traditional ingredients. This is not necessarily bad, as tin the Everest region potatoes are the staple, while around the Annapurnas, rice is more common. South Asian fare is certainly a worthwhile cuisine to explore. Traditional Nepalese, Newar and Indian restaurants are for good reason among Kathmandu’s most popular spots. Tandoor specialties and succulent rice dishes from India, steaming hot momo dumplings from Tibet, and a vast assortment of dals and curries from Nepal offer exciting flavors to initiate the neophyte into the sophisticated world of South Asian spices. Delicious as they are, some people may find them difficult to digests, Knowing one’s intestinal limits can save a lot of internal grief as some bodies simply are not accustomed to the richness of South Asian sauces or the heat of local chili peppers.